Pip and her mouse family are roasting their last chestnut in front of the fire. It has been a hard winter so far and food has been scarce. Papa is going to go away for a few days to get food and hopefully when he gets back he will bring "more food than you've ever seen" with him, and the family will be able to have a real Christmas feast. Pip is fearful because she knows that she might need to help her brother Will look for food while her Papa is gone. Will was injured some time ago and is not very strong any more. Pip has never had to go foraging for food before and the very idea terrifies her. After eight days have gone by and Papa is still not home Pip really begins to worry. Papa was only supposed to be gone for three days. What has happened to him? Pip has had to do almost all of the food foraging on her own as Will is quite unable to get about these days. There just isn't much food to be found out there and everyone in the family is feeling hungry. Pip knows that there is one place where there is plenty of food, at Land's End, the people's house where Will was injured by Cat and where Uncle Hank was killed in a trap. Mama has forbidden anyone to go there again but Pip now feels that she has no choice. She gets all the information that she can from Will and she sets off on Christmas Eve, all alone and hoping that she will be able to bring her family the food they so desperately need. In this delightful little story, a courageous little mouse overcomes her fears to do what needs to be done to take care of her family. In a time of crisis she uses her head to solve a problem and best of all she learns to believe in herself. She discovers that she really can "do anything in the world" if she wants to badly enough. 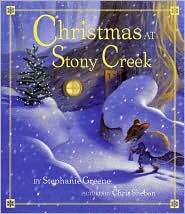 Lovely illustrations and a Christmassy backdrop for the story make this book a perfect gift item for the holidays.